We report on the Ca*+HBr → CaBr*+H reaction when photoinduced within a Ca···HBr complex that is deposited at the surface of a large argon cluster (surface complex). The excitation that turns on the reaction is localized on the calcium atom. Information on the dynamics of the reaction is provided by observing the CaBr fluorescence while scanning the excitation laser across the calcium resonance line. This provides information on the access to the transition region of the reaction and helps to clarify how the argon cluster influences this access as compared to the gas phase experiment where the Ca···HBr complex is free (free complex). Chemiluminescence spectra were also recorded to characterize the output channel of the reaction. Not surprisingly, the presence of the cluster affects the dynamics of the reaction that proceeds at its surface. Several effects have been identified. Depending on which potential energy surface of the Ca···HBr complex is excited by the laser, the cluster acts passively or actively. When the excited 4p orbital of calcium is parallel to the cluster surface and pointing towards the HBr molecule, no drastic change of the reaction dynamics is observed. 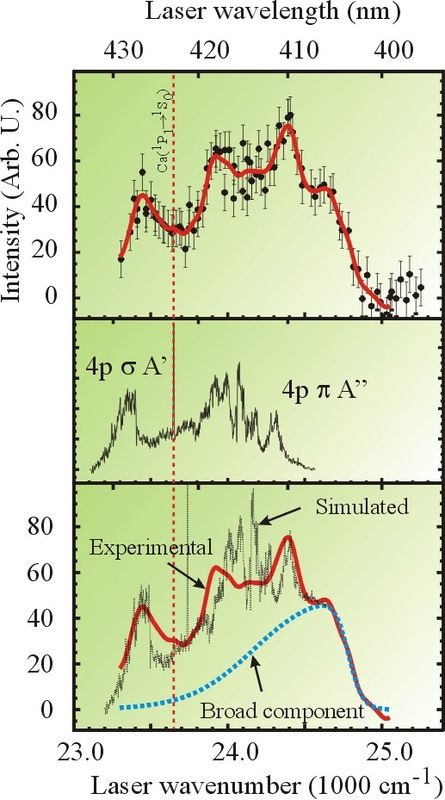 When the 4p orbital is pointing perpendicularly to HBr but still parallel to the cluster surface, the change to reaction dynamics is essentially an impeding of the libration motion in the 4pπ A” potential energy surface of the complex. When the excited 4p orbital of calcium is perpendicular to the argon surface, the cluster interferes more actively with the dynamics of the reaction by adding a force to the system. This excitation scheme kicks calcium away from the cluster surface, thus promoting a movement in the 4pπ A’potential energy surface of the surface complex that is not possible in the free complex. The cluster acts also in the exit channel of the reaction by thermalizing partly the product energy distribution. In particular, it is conceivable that rotational dissipation is the mechanism by which CaBr is very efficiently ejected out of the cluster. Substantial electronic and vibrational cooling is observed also. In particular, a thermal vibrational energy distribution is observed in the 1000-K range for reaction within the surface complex, whereas a population inversion was observed with the free complex. Moreover, the propensity rule that favors the formation of CaBr in the B 2Σ+state is masked in the cluster reaction by an efficient quenching of the B 2Σ+state to the lower A 2Π state. "Excited state reactions of metals on clusters: Full dynamics of the Ca* plus HBr reaction on Ar-2000"
Action spectrum of the Ca*+HBr→CaBr*+H reaction recorded by monitoring the CaBr chemiluminescence as a function of the excitation laser wavelength (top panel). The solid line running through the experimental points results from a smoothing of the experimental data. The middle panel displays the action spectrum of the free complex. The bottom panel compares the two spectra in a presentation where the gas phase action spectrum is blueshifted by 90 cm-1 and added to the broad component shown as a dashed line in the figure. The presence of the broad component and the features that are common between the spectra from the free complex experiment and the cluster experiment serve to discuss the cluster effect mentioned in the text above.